Scroll down for a great selection of Car Show Trophies and Truck Trophies in a wide variety of styles. Even find safe driver awards! Classic street car awards in a variety of styles. Wheel trophies can be used to recognize safe driving, for car show, and even racing events. 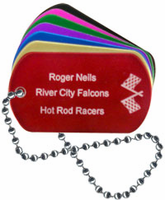 All car trophies include free engraving! Racing Flags Cast Stone Series TrophyFabulous racing car design with helmets and flags! TrophyCentral has a great selection of car show trophies & truck awards to meet all of your needs. 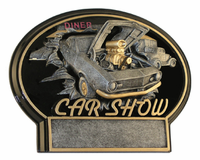 Be sure to see our Burst-Thru Car Show Trophies featuring a car with an open hood, and our Wheel Trophies - perfect for general recognition. 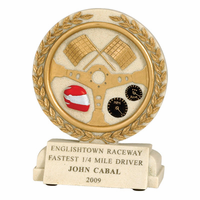 Our Cast Stone Racing Flags Trophies are popular with enthusiasts. We have a large number of car and truck figures, including Camaros, Chevys, Street Rods and Pick-Up Trucks. Each car & truck award includes up to three lines of FREE ENGRAVING (larger awards include additional lines). We also offer FREE SHIPPING on award orders over $100 shipping to the continental U.S.